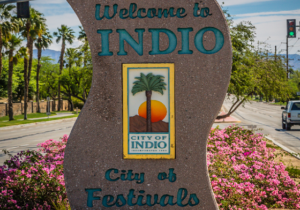 Indio, CA: The City of Indio has the following scheduled maintenance and road closures announced. The grind and overlay project was approved by the Indio City Council on September 19, 2018. Many streets throughout the City will be resurfaced and ADA improvements constructed. The project schedule and construction date is to be determined. This $5.5 million project is funded by Measure X. The Highway 111 roadway improvement project between west of Madison Street and Rubidoux Street continues and will be completed by December 2018. The project will widen the roadway to three lanes in each direction; and to replace and upgrade pavement, traffic signals, sidewalks, driveways and access ramps. During construction, certain traffic lanes in each direction will remain open at all times to provide access to businesses. Construction is being performed in segments to minimize traffic impacts. However, there may be times driveways and side streets may be closed, or utility or traffic signal work will be performed so please adhere to traffic signs and notices. The Highway 111 Street Improvement Project in Indio will increase safety for drivers and pedestrians, improve access to local businesses, prepare for future economic development projects, and accommodate future traffic with thousands of people visiting and moving to Indio every year as the largest and fastest growing city in eastern Riverside County. This $10.3 million project is funded by Measure X, SB 1, Measure A, TUMF, SB1, SB821, and Federal STP. Arabia Street between Highway 111 and Dr. Carreon Boulevard will be closed during certain periods to install a larger storm drain, relocate utilities, and improve street conditions as part of Riverside County’s construction of the John J. Benoit Detention Center. The intersection of Highway 111 and Arabia Street may also be closed for traffic signal modifications to enhance vehicle and pedestrian safety. Work began in June 2018 and will continue through November 2018. Riverside County and its contractors have notified affected residents and businesses. The $2.9 million project is funded by the Riverside County Economic Development Agency. Work was recently completed in August 2018 to improve streets in the Sun Gold Community, which is bounded by Miles Avenue, Monroe Street, Indio Boulevard and Oasis Street. The work included crack filling and slurry sealing existing asphalt pavement sections; and removal and reconstruction of various concrete curbs, gutters, and cross gutters. The $1.2 million project was funded primarily by the Community Development Block Grant Program and a portion of Measure X funds.